If I were to say that, we are now in a new era of entrepreneurism, with highly proficient self-employers who are making more new businesses than ever to compete with the massive monopolies and a stagnant economy, would you believe it? The fact of the matter is, as time goes on there are less and less entrepreneurs and self-starters creating innovative businesses than we have seen in the past 50 years. In actuality, the entrepreneurs who do decide to venture into the self-owned business world have an average age of 40 years old, leaving a question mark as to and why there are less young entrepreneurs than ever. Simply put, this is attributed to the low net worth owned by young aspiring entrepreneurs, paired with the high startup costs and risks involved in starting a business. Moreover, in a time where debts, housing and other costs are rising exponentially, why would younger generations take on one of the riskiest career paths in entrepreneurship? While this may sound bleak, there are some, who are actively trying to change the status quo and help new entrepreneurs get a footing. The Centre for Entrepreneurship Education and Development (CEED) helps not only adults get their business off the ground, but aids in introducing entrepreneurship to younger generations. CEED hopes that one day these future executives will use their self-employment to create new jobs, and a faster more fluid economy. This is all made possible through Juniorpreneur Camp 2019. Juniorpreneur Camp is a five-day ‘create your own business camp’ where campers will pair into groups of 3 – 4 and let their imaginations run loose in creating their own functioning enterprises. Read below for a week of Juniorpreneur activities! Come into camp and meet everyone! They will find like-minded campers and separate into groups to start brainstorming ideas for their business. The day is not without its fun, games and informational activities. The day is spent blueprinting, planning products/services and the early stages of sculpting potential market and customers. Campers begin to nail down their business ideas, as they will have to have everything up and running in two days for sale day! CEED facilitators and leaders give guidance, and help to shape ideas into real, physical businesses. Aside from creating products, services and advertisements, the aspiring entrepreneurs will be learning what keeps a business afloat and how to keep working on their businesses, even after camp ends. Today is a day of hands on learning, as we leave CEED headquarters and head for Downtown Halifax in search of entrepreneurs and other fun business related activities. All activities today will be both entertaining and informative, with a goal of teaching campers how a real entrepreneurial venture is operated. Last year we visited the Discovery Centre and the Halifax Seaport Farmers’ Market, where CEED alumni explained their business and how it came to where it is today. Sale day! Be prepared to broadcast your advertisements and set up shop in the mall just outside of CEED. In years past, campers have sold cookies and other baked goods, homemade valuables such as earrings or other jewelry and even services like shoe cleaners! As any real business would operate, campers will sell their product/service and keep their profits! Last year campers went home with an average of $150, while one group made an astounding $1,200 each! Campers will have the choice to donate a portion of their earnings to a charity of their choosing, with help from CEED. Today is the day campers present their businesses to the world, including a podium of judges who will give them feedback on their businesses and recommendations on how to improve it. In a quick elevator pitch style presentation, campers put their businesses to the final test in determining how viable their business is. Awards are presented to wrap the day up, with new companies winning awards in sales, customer service, marketing and more. 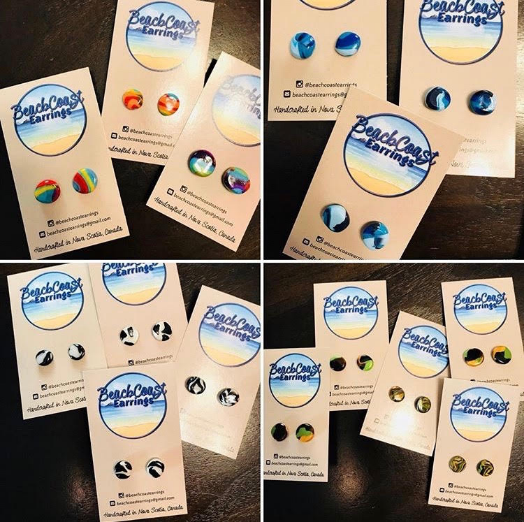 To find an example of a successful Juniorpreneur Camp business, look no further than Beach Coast Earrings. This luxury homemade earring seller came together in CEED’s hallways, and now operates as a full time business! With multiple different products on the market, this group of girls have a serious future in entrepreneurship. They were deemed so successful that they were nominated and awarded the Youth Business Award by the Family Business Association. CEED is incredibly proud of this young group of self -starters, and the many more who have created successful, sustaining businesses from Juniorpreneur camp! Want to learn more about Juniorpreneur Camp 2019? Need to know how to enroll? Check out the link below for a detailed summary of camp, and more!